I’m currently developing a media project that deals with questions around animal emotions, and came across the scientific article here below. It is very important news for everybody who fights for animal rights. Rats and mice in pain make facial expressions similar to those in humans—so similar, in fact, that a few years ago researchers developed rodent “grimace scales,” which help them assess an animal’s level of pain simply by looking at its face. But scientists have questioned whether these expressions convey anything to other rodents, or if they are simply physiological reactions devoid of meaning. 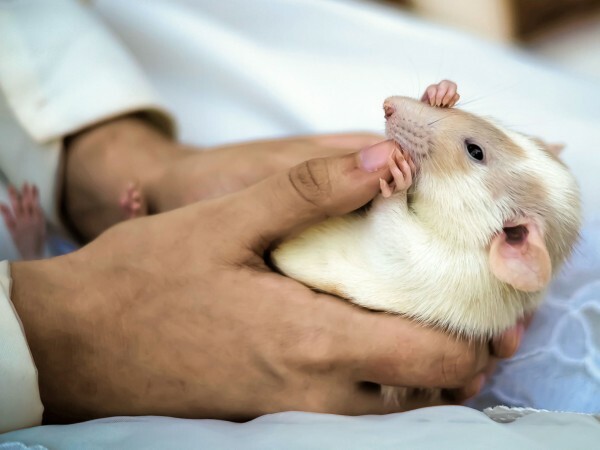 Now, researchers report that other rats do pay attention to the emotional expressions of their fellows, leaving an area when they see a rat that’s suffering. “It’s a finding we thought might be true, and are glad that someone figured out how to do an experiment that shows it,” says Jeffrey Mogil, a neuroscientist at McGill University in Montreal, Canada. Mogil’s lab developed pain grimace scales for rats and mice in 2006, and it discovered that mice experience pain when they see a familiar mouse suffering—a psychological phenomenon known as emotional contagion. According to Mogil, a rodent in pain expresses its anguish through narrowed eyes, flattened ears, and a swollen nose and cheeks. Because people can read these visual cues and gauge the intensity of the animal’s pain, Mogil has long thought that other rats could do so as well. In Japan, Satoshi Nakashima, a social cognition psychologist at NTT Communication Science Laboratories in Kanagawa, thought the same thing. And, knowing that other scientists had recently shown that mice can tell the difference between paintings by Picasso and Renoir, he decided to see if rodents could also discriminate between photographs of their fellows’ expressions. He designed the current experiments as part of his postdoctoral research. First, Nakashima and his colleagues photographed three laboratory rats as they sat in what he calls a “neutral” position—a kind of normal, everyday, unruffled rat pose. He then photographed the same rats while giving them a mild electrical foot shock. In these latter images, the rats tense their bodies and make the classic pain grimace. He created additional images to present to his test rats by airbrushing the photos so that the rat’s face, body, or both were blurred. Next, he mounted the images of the pained rats in one of three rooms in a testing box. He left the walls of the adjoining central compartment blank and arranged the photos of the “neutral” rats in the third room. He made similar comparative arrangements using the Photoshopped images, so that, for instance, one room held a gallery of images showing grimacing rats with blurred bodies, whereas the other compartment showed rats in the neutral position. One hundred and four male rats that had never been used in experiments were then placed one at a time in the center room and allowed to explore the box for 10 minutes, while scientists recorded the amount of time and number of visits each rat made to each compartment. Rats that confronted the unairbrushed grimace photographs rarely lingered, Nakashima and his colleagues report online today in Royal Society Open Science. Instead, they preferred the room with the gallery of neutral rat images—evidence, the scientists say, that the rats were reading the signs of pain on the face of the rat in the photo. Those visual cues “perhaps induce fear” in the viewers, causing them to leave, primatologist Frans de Waal of Emory University in Atlanta said in an e-mail to Science. De Waal was not involved in the study. But the rats that saw the airbrushed images—even those with blurred bodies and upset faces—didn’t react this way. Apparently, the suffering rat’s body also communicates important information, and observing rats need to see both the face and the body in order to get the full message. Studies of nonverbal communication in humans show that we do the same thing, de Waal notes. *Correction, 1 April, 8:55 a.m.: Satoshi Nakashima designed the current experiments as part of his postdoctoral research, not as part of his doctoral research, as was previously reported. The name of the journal has also been corrected.